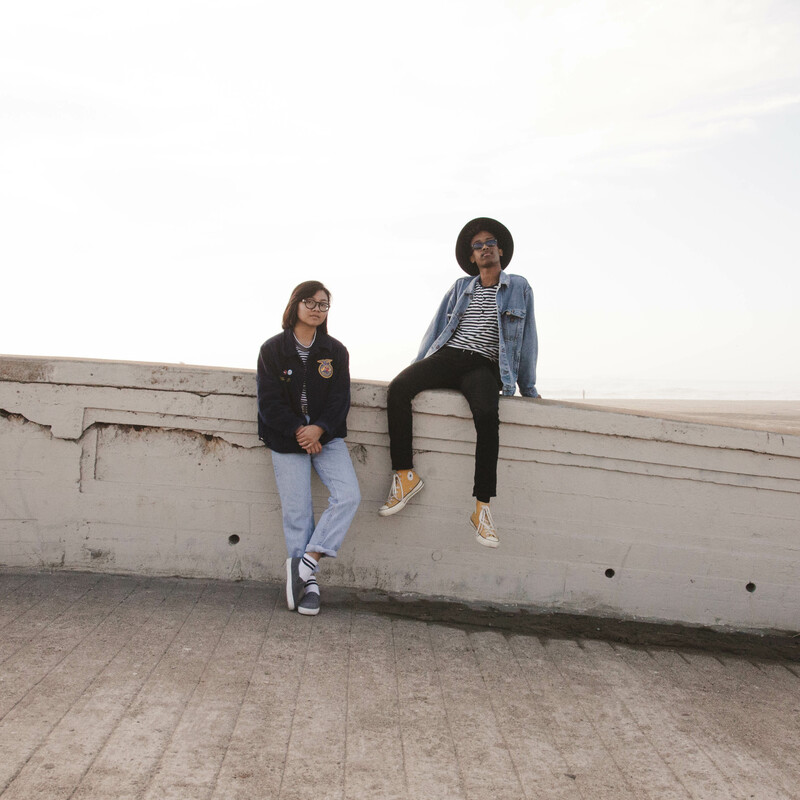 Hailed from San Francisco, indie-pop duo No Vacation began as dorm room project between Basil Saleh and Sabrina Mai as a way for the former to fight his personal depression. 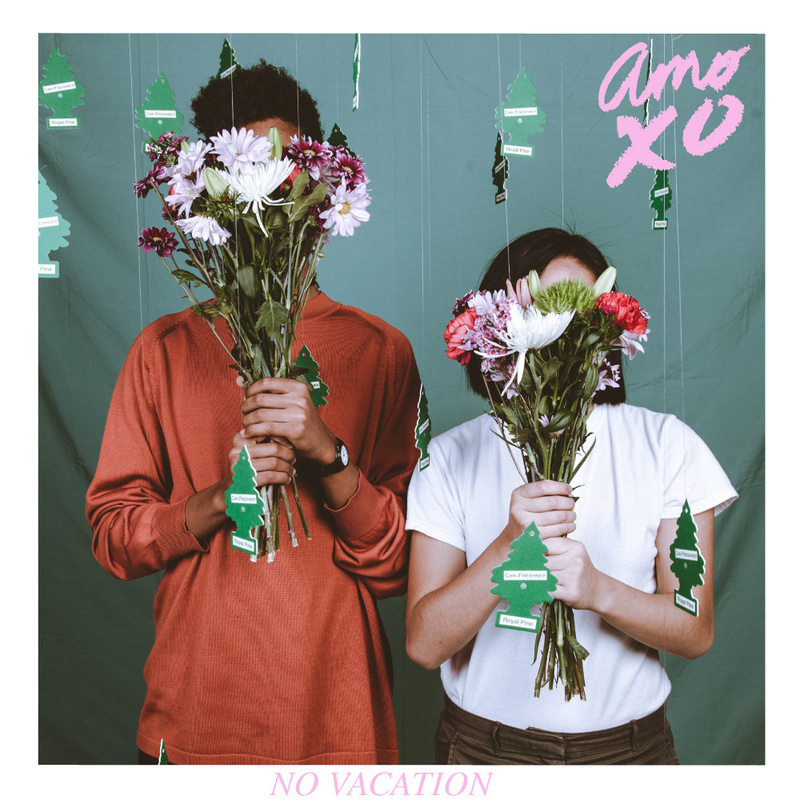 With influences from different musical backgrounds, they’re making their debut “mixtape” called Amo XO which basically a collection of summer-ish buoyant and hazy pop songs perfectly crafted for lazy summer days. Here’s my interview with Basil about the band. Hi Basil! How are you? Where are you right now and what are you doing before answering this email? Hi, so nice to hear from you! Right now I am at the cafe right now with my favorite iced coffee. I just finished my last final exams of the semester earlier today. I haven’t got much sleep this week because I’ve been busy studying, so I’m a bit tired, haha. I think Sabrina is helping her girlfriend move out of her suite right now. So, how was it started? What prompted you to make a band? I had found Sabrina’s SoundCloud and fell in love with her singing. Also, we both had history class together, and had mutual friends, so we were already familiar with each other. I remember I used to be really attracted to one of her friends. One day I went to her friend’s bedroom expecting to get some alone time, and to my dismay, Sabrina was already inside playing guitar along to some music on the floor. Now that I knew she had a guitar, I later invited her to jam with me in the laundromat (even though back then, I was pretty bad at guitar), and that’s kinda how the band got started. The two of us writing songs and playing covers down in the dusty laundromat when we had free time after class. The only song we still have from that time is “August”. Some of the other old songs we wrote were pretty good now that I think about it, I might bring them back in some form or another someday for a future No Vacation record. You define your sound as Post-Tropical Sadcore, care to elaborate more? And what were the biggest influences for your music? That description really just started as a joke, I found a bunch of fake genres names on an emo music blog and thought it would be funny to have that as our genre. Somewhat coincidentally, this joke descriptor ended up being really truthful, as a lot of our songs have a sweet sunny melody (hence the post-tropical), along with sad lyrics (the sadcore). 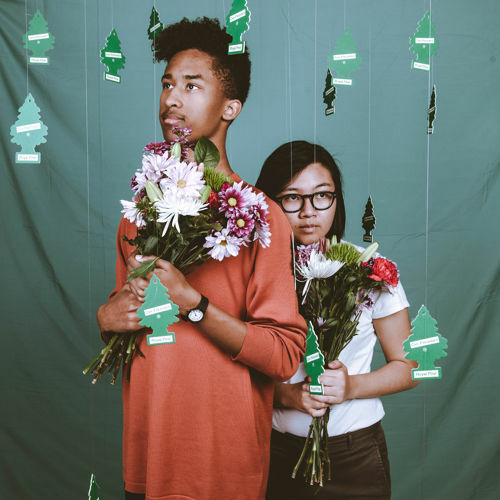 As for music influences, we are all really into bands like The Smiths, Toro y Moi, and Two Door Cinema Club and also local Bay Area indie bands like Surf Club, Leer, and The Bilinda Butchers. Personally speaking I’ve taken a lot of influence from shoegaze bands like My Bloody Valentine, and also electronic music producers like Nujabes. Is there any particular influences from San Francisco itself that reflected on your music? Yeah, the scenery and atmosphere here is a huge influence for us, the city is very chilled out and fun, so it inspires us to write our very melodic indie-pop. I think we would sound completely different if we lived elsewhere. Tell me the story of Amo XO, how’s the creative process and who usually wrote up the lyrics? Sometime after playing our first show together as just the two of us, I told Sabrina i didn’t want to be in a band together anymore, because I wanted to make really loud and heavier sounding music (having been in mostly punk bands before). Around this time, I was dealing with a lot of depression. One of my best friends had just moved from SF back to Austin, and I started feeling isolated and alone all the time. I remember spending a lot of Christmas break either locked inside my room, or wandering around taking long walks at night. I was consumed with a lot of negative feelings. I guess calling Sabrina and asking her if she wanted to record some songs with me was my way of reaching out and trying to get help. She was super happy to pick up where we had left off, and we went to her friend’s home studio with a lot of new ideas. We had each written most of the songs on Amo XO apart from each other by ourselves. So we recorded our individual songs by ourselves, and then once those versions were recorded, I came in and played the other instruments (adding in lead guitar, bass, and synth, and the beats) and did the backing vocals, so most of the songs (with the exception of the two acoustic tracks) ended up sounding completely new and being very collaborative when we were done. I came up with the concept of using samples and outside sounds in the mixtape, so that the mixtape would have more of a story: thematically following the arc of a day, with the intro, interlude, and outro tracks representing early morning, noon, and night. Near the end of the session, we were still one song short, so I went home and wrote the riff for “Beach Bummer”. Since we usually write our own lyrics and just bounce them off each other, the next day we came up with our individual lyrics together and finished recording. I still remember us getting the finished mixtape on CD after our final day in the studio and feeling the happiest I’ve ever felt just driving around playing the songs over and over on the car speakers and eating falafels. Our first gig was really special, we have our keyboardist Nat to thank for that. She got us the gig, through this SF based collective called The Secret Show Society that plans and throws annual hidden shows in different remote locations and only promotes the shows by word of mouth. So it was cool playing our first gig as No Vacation to a big crowd at such a cool event, and we were able to play a really good first show and kind of stun the crowd. The people who had listened to Amo XO already were super shocked with how loud and energetic we were live, and the people who hadn’t heard it yet thought we were some kind of shoegazing punk band. What’s the most memorable gig so far? We just played the legendary SF venue Bottom of the Hill, and it was an incredible experience. I was ridiculously nervous because it was the biggest show we’ve played so far and we had just played two awful shows in the weeks before where my guitar broke. This time we were playing in front of a packed venue, with some big music business people in the crowd. But we played our best gig yet and gave all the fans a great show, so that was super relieving! Also, that night, my all time favourite band, The Bilinda Butchers came out to see us and I got to chat with them after the show, it was so cool meeting my heroes and finding out that they are just like me! We have grown so fast for being such a young and new band, it’s been such a humbling experience for me. We just want to keep spreading our music and growing our audience, as well as becoming a better band and better musicians. Thanks to Converse, we got to record some new songs in their professional studio with Rubber Tracks SF. We think people will love the new EP we have coming out. No Vacation is no longer just two people, we are a full band with five members now, and the new songs reflect this. Our new stuff has a lot more energy now but still retains the trademark style that fans of our songs are used to. I think the next step is for us to find a record label that can help us expand even further. We want to play big festivals like Coachella someday, just like all the bands we love. We also want to tour in Europe and Asia as well because we have a lot of fans outside of the U.S. that we would love to play for. Last, where’s your dream vacation would be? I went to a lot of cool places as a kid when my dad took me on his travels. But right now i’m discovering so much just in San Francisco and having so much fun just living my life. But to answer the question, I listen to a lot of Japanese music, so I guess my dream vacation would be to go on tour there with my band and play some gigs there and explore Tokyo. I’d also like to visit both Austin and Boston in the U.S. sometime soon to visit my friends there and see some of the great local bands in those cities.